Review Fix chats with Phi Dinh, the Creator, Project Manager, Programmer and Founder of Phigames, as well as the developer of ‘TinyKeep’ about the clever RPG set for release this September. From its inspiration to thoughts on the development cycle, Dihn gives us the inside scoop in what appears to be a hit game in the making. Review Fix: What has the development cycle been like thus far? Review Fix: What games do you feel inspired “TinyKeep”? Dinh: Growing up I loved playing DOS games such as Rogue and Nethack, as well as geeky board games like Hero Quest. TinyKeep is clearly inspired by dungeon crawlers, but recently I’ve been drawing a lot of inspiration from the more modern roguelikes and permadeath games of the past year or two. Titles such as Spelunky, Risk of Rain and Vlambeer’s Nuclear Throne. All of these contribute hugely to my game design ideas – but with TinyKeep I want to try and create something of a twist to the genre, where I can hopefully strike a fine balance between permadeath and progression. Dinh: The thing I enjoy about TinyKeep the most is finding out new and fun ways to wreak havoc on the dungeon’s monsters. I like to create games with many simple interlocking systems which when put together, can result in really surprising situations and stories. For example, in one playthrough I decided to release a fellow prisoner from a makeshift wooden cell, but instead of being eternally grateful he attempts to attack me in his crazed delirium. The noise attracted some nearby prison guards, who come rushing into the room accidentally setting off a number of deadly spike traps. The next few minutes were absolute mayhem and chaos. Review Fix: There’s been so much talk to the AI thus far. Can you tell us what makes it so special? Dinh: I’ve played so many games where the enemies fail to do one important thing: run away! So a year ago I decided to create a prototype game where some monsters do exactly that. It changed the dynamic completely. Eventually that prototype grew into the project I’m working on today. Now enemies can hunt, retreat, work together in teams against you, and even fight and compete with other races. The rivalry between the humans, Orcs and Skeletons is going to be a key feature for the game, and it’s one of the things I’m really excited to show. Review Fix: How much work has gone into the level design? Dinh: Those that know me well or have read my articles on Reddit, know that I’m really passionate about the subject of procedural generation in games. Prior to TinyKeep, I worked for several months on a new technique to generate random dungeon layouts. There are a lot of people who assume that procedurally generated content is much easier to implement than smart level design – but I feel the exact opposite is true. It’s really difficult to create a random environment that not only looks good but is fun to play as well – I think I have achieved this with TinyKeep. Review Fix: What do you think is the game’s strongest feature? Dinh: As I said before, it’s all about the surprising and emergent situations that arise from a combination of interesting monster AI and environments. Dinh: I really want to show people that RPG games needn’t just be about dry stats and number crunching, but about fun interactions as well. Review Fix: For those who haven’t played the game yet, why do you think they should? Dinh: The game isn’t available to the public yet – it’s still fairly early in development. 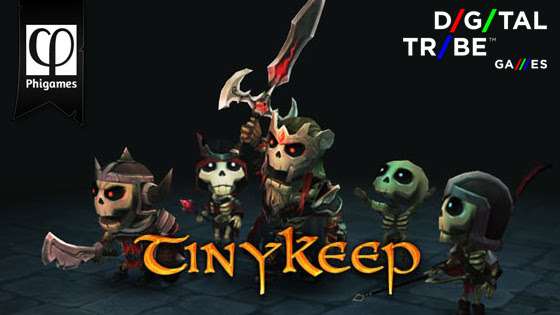 But once it is released, I think that if you love the idea of a realtime roguelike sprinkled with intelligent monsters and tight action-oriented gameplay, then TinyKeep is the game for you. Review Fix: What do you hope players will get out of the game when they can finally get their hands on it in September? Dinh: Hopefully hours of exploring dark dungeons and finding out surprising new things every time. Hell’s Kitchen Season 12 Episode 2 Recap: Carrots Anyone?